263 rooms with 8 luxury suites and a Presidential suite. The top floors enjoy spectacular views over the City. Business and Health Centres - covered parking - shopping mall. Discounted online reservations. 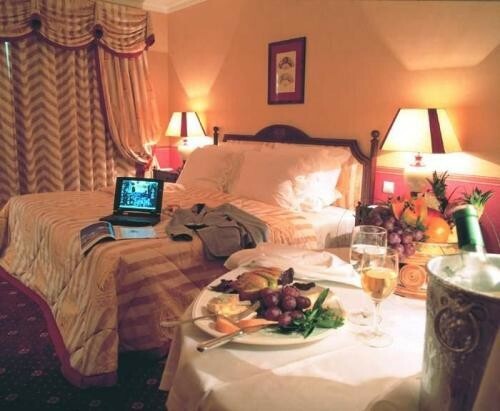 Hotel Dom Pedro Palace is situated near to the heart of Lisbon, and was opened in 1998 to provide tasteful modern comfort and a quality service to the needs of visitors whether they are on a business visit or just for pleasure. There are 263 bedrooms and suites and are suitably furnished with comfort and king-size beds. Added to all the normal 5 Star room facilities guests will find each room or suite also furnished with a elegant and practical work desk. 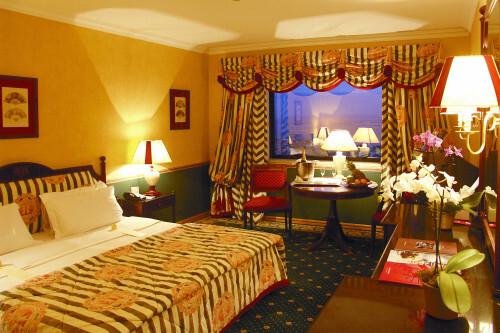 'Classic' rooms are ample with 31 square metres, and the 'Classic Corner' rooms are even larger with 33 square metres. There are also connecting rooms. The deluxe accommodation of which there are 59 rooms and are classified as 'Tower' rooms, begin on the higher floors between the 15th and 19th. They are designed and equipped for executive guests, with such facilities as a fax machine and high-speed Internet access. The 'Tower' rooms average 29 square metres in size. 'Tower Corner' rooms are significantly larger measuring 32 square metres. Those guests choosing to stay in the 'Tower' bedrooms have the additional advantage of freely using the panoramic VIP lounge located on the 19th floor with complimentary tea, coffee and a selection of international newspapers and magazines. There are 8 luxury Premium Suites on the 20th floor with unparalleled views over the River Tagus and downtown Lisbon with the Castle of São Jorge. The Suites are a comfortable 58 square metres in size. 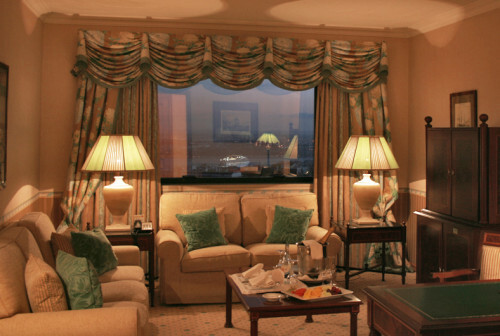 Guests also enjoy free access to the VIP lounge on the 19th floor. The Clinton Master Suite is one of Portugal’s most exclusive places to stay. Covering the entire top floor with a 360 degree view over the historic and beautiful City and the River Tagus. With an area of over 420 m2 and a private elevator, the Clinton Suite is elegantly furnished and equipped with a conference area to give complete privacy. It also has a separate dining room leading out onto a huge 60-square-metre terrace. It has a spacious and fully equipped kitchen which is serviced by a butler and maid dedicated exclusively to its guests. The master bedroom contains a king-sized four-poster bed, overlooking a separate and secluded terrace. This bedroom connects to its own dressing room and its marble bathroom, with an oversized bathtub and a hydro-massage cabin. 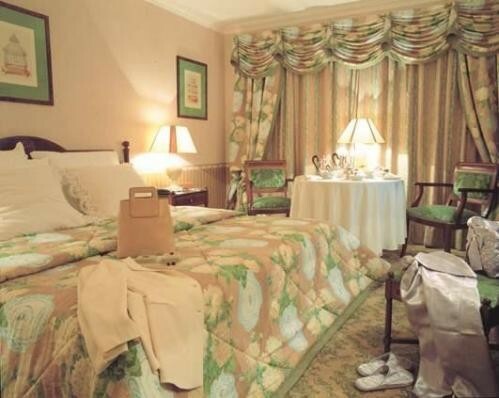 The second bedroom also has a king-size bed and luxurious marble bathroom. With its security measures and location, it was the choice of both the American and Russian presidents during their stay in Lisbon. The Hotel's main restaurant is the fashionable 'Il Gattopardo' which specialises in high quality Italian cuisine. For the more casual meals there is the 'Le Café' which serves lunchtime regional buffets, afternoon teas, and late night fare. There are two cocktail bars for that relaxing drink. There is a well equipped Business Centre and a Massage & Fitness Centre. The Hotel has its own covered parking facility and a Shopping Mall. Located between 4th and 14th floors, these elegantly decorated room come with an LCD TV, air conditioning and a work desk. Located between the 4th and 14th floors, these air-conditioned rooms feature LCD TV and a work desk. Includes access to the panoramic VIP lounge where bar services as well as international newspapers and magazines are fully available. A suite featuring great city views, Molton Brown toiletries and free access to the spa and the panoramic VIP lounge. Please note that the rate is based on 4 guests (2 adults and 2 children from 3 to 12 years old. See Hotel Policies). Located between 4th and 14th floors, these elegantly decorated room come with an LCD TV and air conditioning. Located between 4th and 14th floors, these elegantly decorated rooms come with an LCD TV and air conditioning.